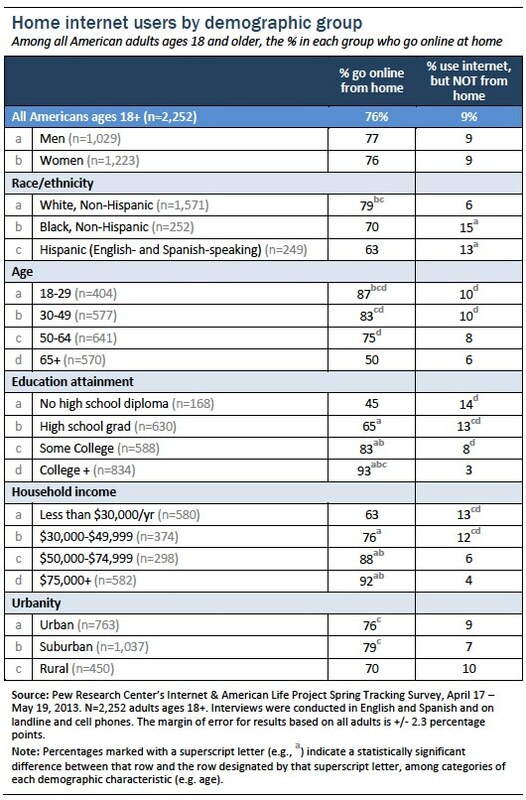 As of May 2013, some 15% of American adults ages 18 and older do not use the internet or email.5 Another 85% of U.S. adults do go online, as shown in the chart below. 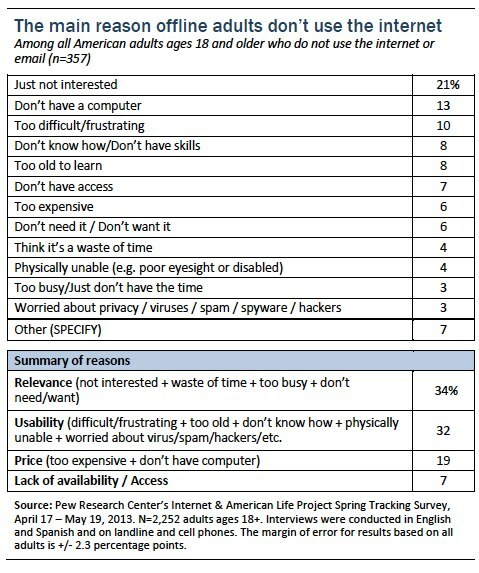 When asked the main reason why they do not use the internet or email, non-internet users give a variety of answers. Among current non-internet users, the most often cited reasons for staying offline relate to issues of relevance or usability: 34% of offline adults say that they just aren’t interested in going online or don’t need to, or that they are “too busy” or think the internet is a waste of time, while another 32% mentioned usability-related issues, such as finding it to difficult or frustrating to go online, or saying that they don’t know how or are physically unable. Some 19% mentioned price-related reasons, 7% said that a lack of access or availability is the main reason, and 7% cited some other reason for why they don’t go online. 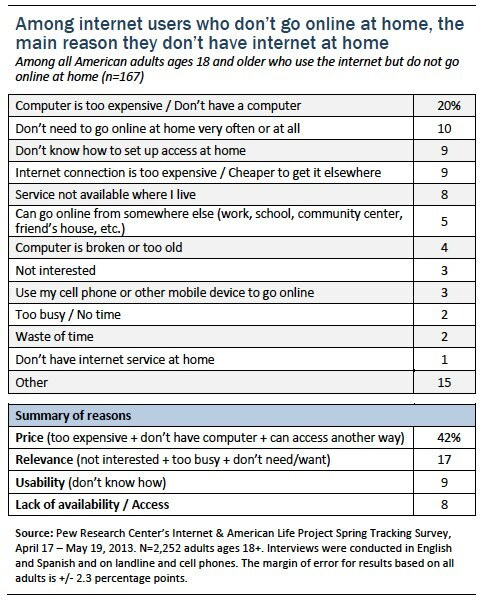 The types of reasons non-internet users give for staying offline have shifted in previous years. 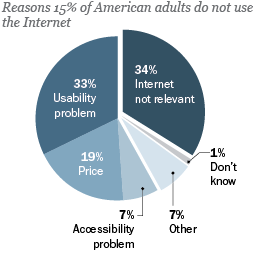 One of the most striking changes is that issues related to the difficulty of using the internet are more prominent than they were in previous surveys, while in 2010, for instance, almost half (48%) of non-internet users cited issues of relevance, and only one in five mentioned usability or price-related reasons, respectively. Though they themselves do not go online, the internet often touches offline adults’ lives in various ways. 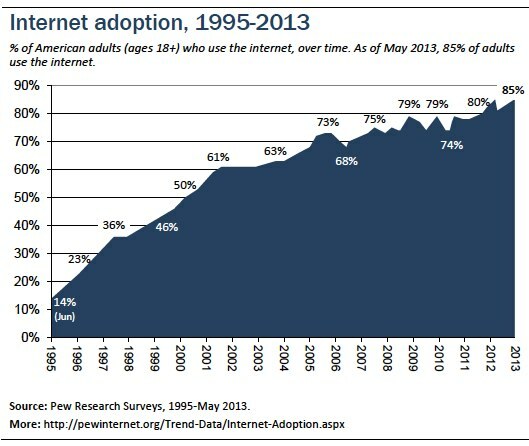 A small proportion of non-internet users have been online in the past. 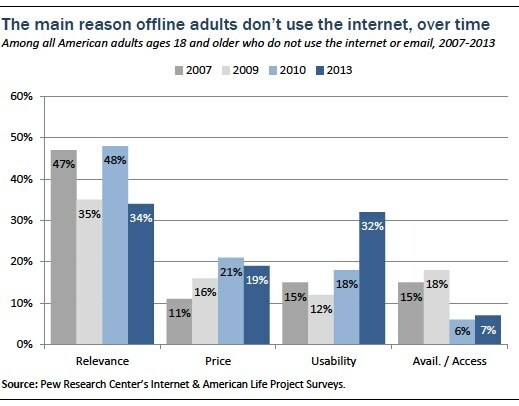 Some 14% of offline adults say that they used to use the internet, but have since stopped for some reason—down slightly from the one in five who said this in 2009 and 2010, but similar to the 17% who said this in 2002. And though most offline adults do not have direct connections to the online world, many have accessed online resources by proxy. Some 44% of offline adults have asked a friend or family member to look something up or complete a task on the internet for them at some point, as shown in the following chart. Finally, 23% of offline adults live in a household where someone else uses the internet at home, a proportion that has remained relatively steady for over a decade. Overall, 33% of offline adults have had some exposure to the internet, either because they used to use the internet, but have since stopped for some reason, or by living in a household where someone else uses the internet at home. Ultimately, most offline adults do not express a strong desire to begin (or resume) using the internet. Just 8% of offline adults say they would like to start using the internet or email, while 92% say they are not interested. Adults ages 65 and older are significantly more likely than any other age group to be offline, with 44% saying they don’t use the internet or email; among the next youngest age group, adults ages 50-64, only 17% don’t go online. If we narrow our focus to members of the G.I. Generation, those born in 1936 or earlier (ages 77 and older in 2013), a full 62% don’t use the internet or email. 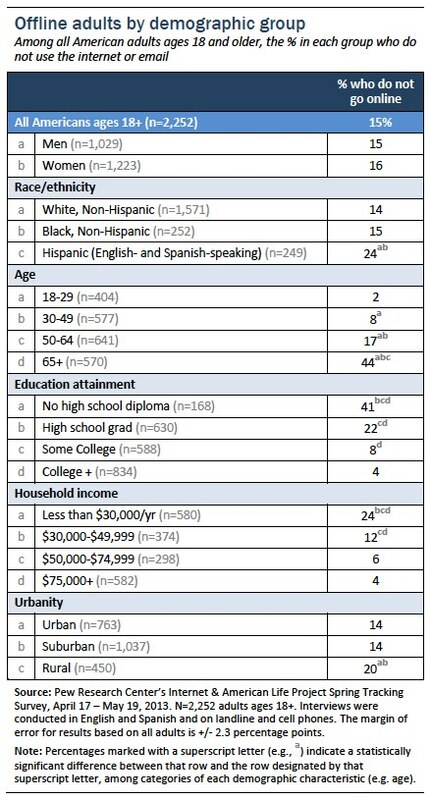 Overall, adults ages 65 and older account for almost half (49%) of non-internet users by age group. 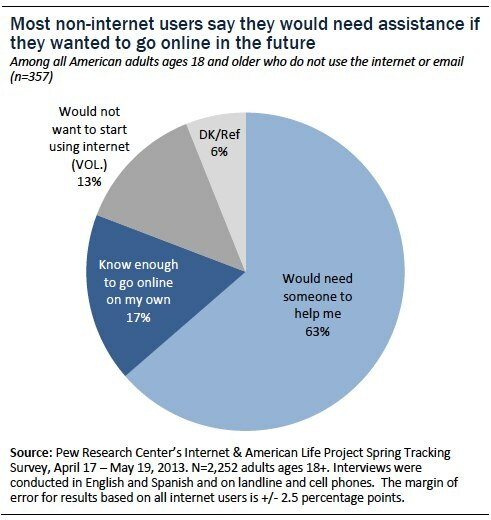 Asked whether they would be able to start using the internet in the future, just 13% of non-internet users ages 65 and older said they would know enough to go online, while 66% say they would need help. 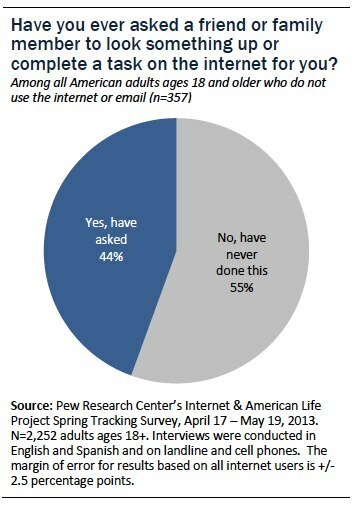 Just 5% of offline adults in this age group say they would like to start using the internet or email. Finally, 44% of non-internet users ages 65 and older have asked a friend or family member to look something up or complete a task on the internet for them, a rate similar to other offline adults. Among all adults, groups that are more likely to be home internet users include adults with higher levels of income and education, whites, and those living in urban or suburban areas. Meanwhile, groups that are significantly more likely to rely on internet access outside the home include blacks and Hispanics, as well as adults at lower levels of income and education. 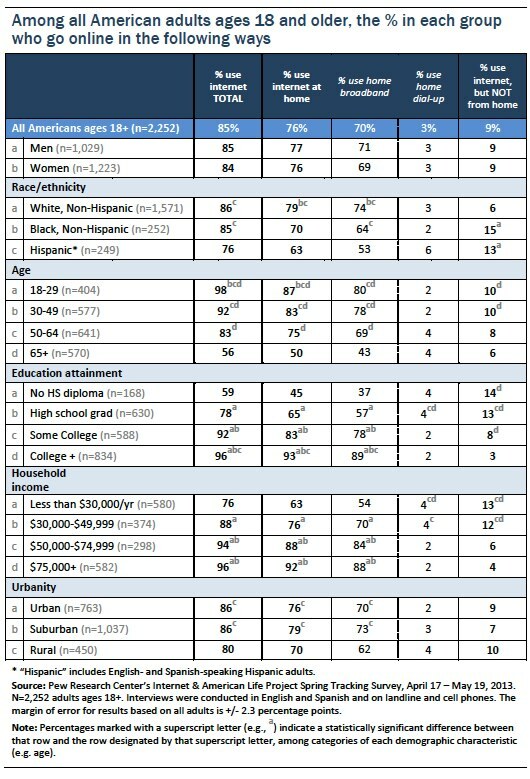 Finally, due to their increased likelihood to use the internet overall, younger adults are more likely than older adults to go online either at home or to rely on external access, as shown in the following table. We also asked the 9% of adults who use the internet but don’t go online from home the main reason why they lack home access. They mentioned several factors, most often relating to issues of affordability—some 42% cited financial issues such as not having a computer, or having a cheaper option outside the home. Another 17% mentioned issues of relevance, such as not needing to go online from home too often, and a few mentioned usability issues, such as not knowing how to set up access at home. Finally, another 8% mentioned lack of internet availability or access as the main reason they don’t go online at home, and 15% mentioned some other issue. There are few clear differences between different demographic groups, although adults living in lower-income households (4%) are significantly more likely to have dial-up than those in higher-income households (2%). Adults who have not attended college are also more likely than those with higher levels of education to have home dial-up.